If you’re short of counter space in your kitchen, cannot do without a microwave, and like to bake, grill or toast a few things every now and then, you can probably get by with just a single appliance for all these tasks. The best microwave toaster oven combination is energy efficient and fast for all your reheating and defrosting needs, while also giving you a decent cake or reheating pizza. It is usually not as good as a dedicated toaster oven if you intend to bake, grill or toast often. For that, I recommend a proper toaster oven, or even better, a convection oven. When choosing one of these appliances, make sure the microwave is powerful enough for your needs, as underpowered ones take a long time reheating food. The oven performance is determined by the convection heating that circulates the air inside for even baking. Some of these units also include a grill function if you want a crisp brown top on your food. You might also want to check out the Cuisinart Steam and Convection Oven if you do a lot of steaming of food or bread baking as well. Rated at 1000 watts, the Samsung Countertop Convection Microwave Oven comes in one of two sizes – 1.1 and 1.4 cubic ounces. The microwave operates with sensor functionality over 10 power levels, so cooking time and power level automatically adjusts as the food cooks. The defrost function can be selected based on time, weight or type of food. The turntable can be set to rotate or not, depending on what you want to cook. The convection mode works with the help of a heating element and fan that circulates hot air for even cooking. While the food is cooking you can use the electronic dial to increase or decrease cooking time as you wish. The inside is made of ceramic enamel so it is easy to clean without the presence of potentially unsafe non-stick coating. The advantage of this convection microwave unit is its ease of use and precision cooking. However, you should know that you can only set it to 30 second increments at first and then use the dial to adjust that by 10 seconds once it starts. This does not have a traditional kitchen timer. The oven does have a light inside but it’s not very bright. Another good convection microwave combo oven for the countertop that’s also rated at 1000 watts is the GE Profile 1.5 cu. ft. Convection Microwave Oven. It comes in 4 different sleek finishes to go with your kitchen decor and an optional trim kit if you want to use it as a built-in unit. The digital display with clock scrolls to give you read outs and there are easy one touch cooking control touch pads to select between presets, 10 power levels, temperatures and the timer. The interior of the oven is stainless steel with a removable pedestal oven rack, and the turn table is glass recessed to maximize capacity. This convection and microwave oven also uses sensor capability controls to automatically adjust time and power during the course of cooking. You can use either the convection mode for baking and broiling, or the microwave mode, or a combination of both. Or you can just use the Warm mode to keep cooked foods warm until mealtime. You can also add cooking time to the selected cook mode in 30 second increments. There are also 4 sound levels that you can set to control the volume of the alerts and you can set the oven to a delayed start. The biggest disadvantages with this GE Profile unit are that there is no “reheat” option and you’d have to use your own times for that and the “defrost” setting is specifically for meat and veggies and not for baked goods. However, this unit can replace a regular convection oven and produce wonderful baked goods along with performing all the day to day tasks as well. The manual is not the most detailed or easy to follow so expect some trial and error on your part. With a 1000 watt power rating, the Toshiba EC042A5C-BS Convection Microwave Oven truly gives you the best of both worlds. The microwave is a full featured unit with 6 One Touch presets, 10 power levels, and a menu for sensor cooking items like pizza, potatoes and veggies. The built-in sensors that determine appropriate reheating and cooking times. The sensor setting will automatically cook your food the way you want it, just punch in the food type, program the setting and push start. That’s as close to automatic cooking that you can get. The convection oven lets you bake, brown, broil and crisp between 175 and 425 degrees just like it was your main unit. It has 4 auto functions – two for baking and two for roasting. The latter auto functions can be set based on the weight of the food to be roasted. Defrosting can be done in one of two ways – time defrost or auto defrost. The former lets you set the time is takes, while the latter does it according to the the weight of the food. If you don’t want to use any of the auto functions or presets, you can just as easily set your own desired time and power level and use the up and down buttons to add or decrease time as it cooks. If there’s any combination you find yourself using time and again, just save it as one of 3 of your own presets! Convection ovens spread heat around the interior with a fan. That means food items heat faster and cook quicker. Although not as fast as a microwave, for baked or broiled food items, a convection oven is the fastest way to cook them. With a 1.5 cubic feet capacity, a 13.6 inches turntable and an oven rack for grilling, you get complete versatility at a very reasonable price. If you don’t necessarily need your microwave to be able to bake but want to be able to grill and crisp foods in addition to reheating, defrosting and cooking, then take a look at the Samsung Counter Top Grill Microwave. 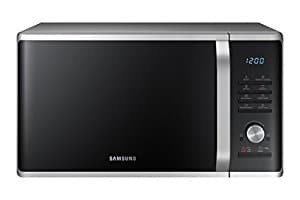 The larger 1.4 capacity Samsung microwaves with 950 watts, while the smaller 1.1 cubic feet works at a full 1000 watts. The only other difference between these two is that the smaller unit has a regular front finish that you see on most microwaves, while the larger has a premium mirror finish on the front. Otherwise, the common features include 10 power levels with auto cook microwaving. The interior is better scratch and stain resistant on account of the ceramic enamel. Samsung utilizes a separate heating element that allows you to actually grill in your microwave, and you can use the grill feature whenever you want a crispy finish, like for a pizza, fish, sandwich, etc. The included ceramic plate helps this type of cooking. You’ll need to set the grill rack in place on the rotating turntable, and there is a separate button to activate the heating element. This very functional design will replace your oven and your electric grill for most small grilling tasks, and it will even use less energy in doing so. Perhaps the best thing about this unit is the fact that this is the lowest priced unit on this list with these capabilities. However, the limitation is that you can’t bake in this, as there is no multi-directional heating or circulation fan. If you want a similar microwave and toaster oven combo to the Samsung above but also want to be able to bake in it, the Cuisinart CMW-200 Convection Microwave Oven with Grill may be just your ticket. This is one of the lower priced units with all of these features, and best of all, Cuisinart quality means it comes with a limited 3 year warranty, which is the best in the business. The microwave is a full 1000 watts with 9 preset levels for quickly heating or reheating food, the grilling feature uses a metal rack and works like any other electric grill, and the convection oven lets you bake cakes, bread, casseroles and more too. The grill rack is reversible with two sets of legs, so you can choose to set your food closer to or farther away from the grill element. But don’t stop here. It has a multi-stage cooking function that lets you either program in the different cooking cycles for specific types of food, or you can push one of the pre-sets. For example, you can bake a lasagna using one setting but set it to grill at the end so as to brown the top. You can do this with just a push of a button, so that when your dish is done, it comes out perfect. If you’d rather control temperature and timing yourself, you can choose from 10 temperature levels from 100 F to 425 F and increase cooking time in 30 second intervals. For no guesswork cooking, the Emerson Convection Microwave Oven with Grill Touch Control Countertop is a moderately advanced unit that will take care of all of your cooking needs at the touch of a button. This is a moderately priced unit but it it does not do sensor cooking. Other than that, you can grill and roast, use the convection feature for baking, or activate the 1000 watt microwave function, just by pushing a pre-set button and walking away. The grill rack gets the food up close to the grilling element for quick and even browning and the 13.5″ glass turntable is removable for easy cleaning. The microwave can be set to one of 9 cooking presets, along with 11 power levels. If you want to defrost anything, just enter the food’s weight and it will automatically set the power level and time, however, the traditional method of just entering the time manually is also possible. The Child Safety program locks the appliance out so that it cannot be accidentally started by kids. Does any of the microwave ovens toast bread as well? brand that replicates all features?